But now for the positive, this is a great ride on mostly good bike paths. If you are in any way concerned about hills, weather, trail conditions or stamina, I highly recommend an ebike. This will mitigate almost all issues and still offers all the benefits of biking. 30-35 miles a day is a lot to cover with the drawbacks of being in a group, so most of the riding was at a pretty quick pace. Ha sido un tour fantástico. Hemos hecho la ruta desde Copenhague a Berlín, con unos paisajes increíbles, disfrutando de estupendos carriles bici. Es nuestro cuarto tour y esperamos continuar con un nuevo destino. Unas vacaciones inolvidables!!! It was a fantastic tour. We have made the route from Copenhagen to Berlin, with incredible landscapes, enjoying great bike lanes. It is our fourth tour and we hope to continue with a new destination. An unforgettable vacation!!! This is a great ride, if you use the right company. We used Tripsite, who contracted Austria Radreisen, not the company to use. We were told that Austria Redreisen would meet us at the hotel in Passau the day before the trip was to start...they did not show( a competitor company, Donau, spent 2 hours with their clients, in our hotel). We tried to contact Austria Radreisen at their 'emergency' number...no one answer/no answering machine. The day the tour was to start, they delivered two bikes which were extremely heavy, and with 7 speed changers....we had specifically ordered 21 speed hybrids. The bikes were delivered by the person who picked up the suitcases, and we were told by him that he had no knowledge of how the bikes worked...we were on our own to figure them out. In spite of being in good physical condition, we found the bikes very difficult to use, as they would not coast. After 2 days with the heavy bikes, we had to take a day off as we were exhausted. Thanks to the help of a receptionist at the Courtyard Marriot in Linz, the company delivered replacement 21 speed hybrids(which we should have received in the first place) at our next hotel (we had to take the train to get there), which we used with no problems the rest of the way. The hotels provided by the company were excellent, and the travel maps adequate. We certainly will not go with this company again when we plan our next bike tour. The opportunity to experience rural Germany close up was awesome and made even better with the efforts of our guide and crew. Overall the trip was good and the weather conditions with the Danube were out of the tour company’s control. The biking that we did do was spectacular! We were on the Merlijn from Merzig to Mainz; biking along the Mosell and Rhine Rivers. We biked through vineyards, sunflower fields and picturesque, quaint towns. This was our fifth bike and barge tour booked through Tripsite and we are looking forward to the next. Be adventurous and try a self-guided trip in Germany. 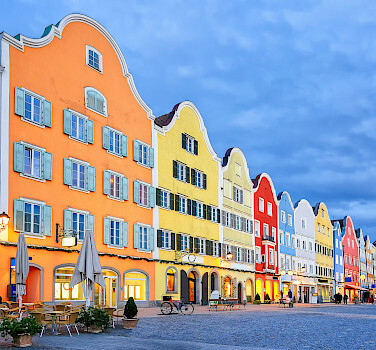 You'll enjoy beautiful scenery, lakes warm enough to swim in and charming Bavarian towns. The routes are well marked. If you enjoy cycling at your own pace, this is the trip for you. This is a must trip for anyone who embraces the Bike and Barge experience with a small group. The Merlijn is an extremely well managed boat with the owners attending to every detail in a friendly and caring manor. This trip checks off all the boxes, good food and drink, comfortable accommodation and arguably some of the most beautiful scenery in Europe. My only suggest is to book it early as it fills up quickly and in particular on this boat. Both great suggestions and easily doable. Thank you. The scenery was gorgeous, there were quaint little towns around every bend of the Saar and Mosel rivers. Our bike guide was excellent and very knowledgeable about the areas we were at. The food was plentiful and dinners were way above average. Great tour!